Even the smallest commercial trucks are packing about four times as much weight as a typical personal vehicle. And while we’re not physics experts, we know it takes a lot of force to control all that tonnage. Haldex brake systems and air suspension controls are installed on thousands of light-, medium- and heavy-duty trucks and trailers whose drivers can’t afford to slow down slowly. Based in Sweden with locations around the world — including the U.S. Haldex offices in Kansas City, MO and Vancouver, WA — the company has come up with ways to make any large vehicle stop faster and handle better. 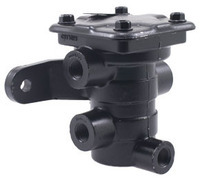 Visit FinditParts anytime you’re looking for the best selection of truck brake parts. Haldex revolutionized drum brakes with their automatic brake adjusters. 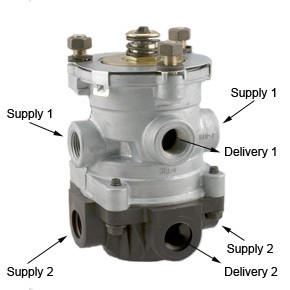 This hardware precisely accounts for system use so you will always have like-new stopping power. But they are leading the way in other braking systems as well. 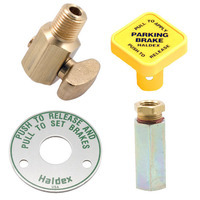 We have Haldex components for spring brakes, air disc brakes, anti-lock brakes and hydraulic brakes. You can also get complete brake hardware kits for installations, plus brake clutches, valves and vacuum boosters for making strong connections. Your ride will be smooth between stops with Haldex suspension parts under the body panels. Haldex has partnered with Monroe for a premium line of shock absorbers and struts that can handle the rigors of 40-ton loads. Enjoy even more riding comfort with air suspension linkages, solenoid valves and power steering pumps and gears. Haldex has expanded its reach under the hood as well with rugged alternators to keep electrical components running and water pumps to help engines stay cool. With more than 100 years of experience in the truck and automotive fields, Haldex is a veteran of giving drivers control at the wheel. You’ll find everything you need for your truck’s braking and suspension systems at FinditParts. Our customer service team is glad to help figure out what goes on your vehicle, and we get your order to you fast with two-day Express shipping on our best-selling Haldex parts.